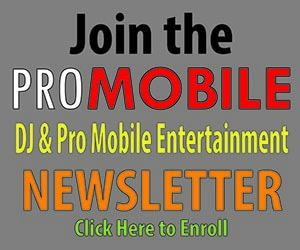 Mobile DJs need to book events to have a successful business, yet sales often intimidate even the most seasoned among us. Why are so many people afraid to ask for the sale? It’s the fear of rejection that holds us back. Take the selling out of the selling process and you’ll find that closing sales is simpler than you think. Try these seven simple steps on your next appointment. Don’t talk yourself out of the sale before you even get to the appointment. Keep in mind the prospect took time out of his or her busy day to hold the appointment. They must be interested in what you have to offer or they would not have agreed to meet with you. Be positive and go in with the attitude that you have what the prospect needs or wants and they are ready to buy. 2. Be confident in your expertise. Think of yourself as a doctor of fun; someone who has the experience, training and expertise to “cure the pain of boredom.” Your prospect has a problem and your knowledge, services and techniques will bring them relief and alleviate their problem. When you visit the doctor, the first thing he or she might ask is, “What’s wrong today?” It’s wise to do your homework before you meet with your prospect so you’re more equipped to ask the right questions. In turn, your prospect will generally tell you exactly what they want or need. Then tailor your proposal or presentation to those precise needs. The best doctors listen instead of talk about their revolutionary new products. They listen to what is said, and then they provide an examination to see if there are core problems. Probe your prospects to find out what their fears are and want they want, and listen well. This is not the time to talk about your qualifications, track record, extensive client list, or what you think you might bring to the table. Being a good listener is key to closing the deal. Even in this technological age, it’s wise to have a pad of paper and a pen ready to write down the items your prospect is listing. Number them as you hear them. Once the prospect has voiced all their concerns, go back over the list one by one and address each problem, and then offer suggestions on how you can help. Remember the adage: “When you give, you get.” Offer advice freely to build a trusted relationship with your prospects. Your generosity will be appreciated and will help position you as a team player. Don’t include items that are not relevant. Each prospect has a unique set of needs, so avoid a canned presentation and customize whenever possible. 6. Ask for the sale. Close the sale by transitioning to the next step. You might say something like, “Are you ready to move forward a book your date?” or “Which of the items we talked about do you want for your wedding?” It’s best to avoid a “yes” or “no” question because this gives the prospect the opportunity to say “no.” Have a contract ready for your prospect to sign, review your terms of engagement, and discuss the next action step before you leave. It may time some time and a bit of practice, but when you use this process, you will find that booking events is not as difficult as you might have imagined.